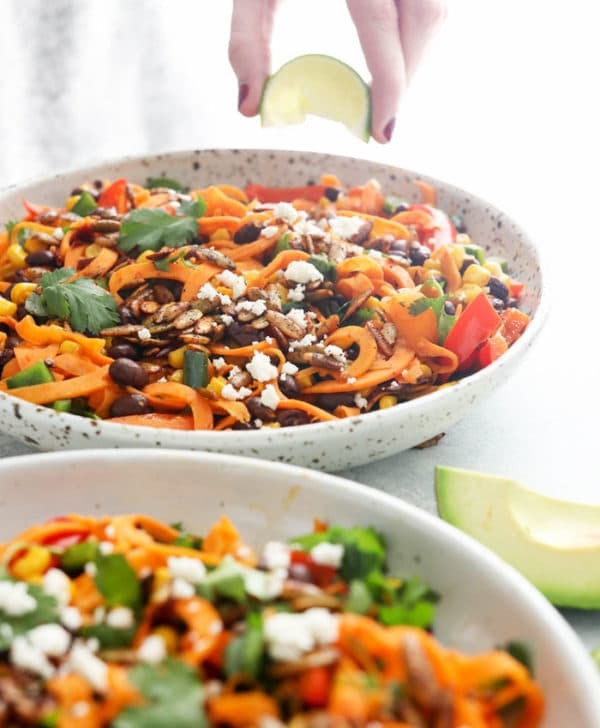 These Chipotle Sweet Potato Noodles have a comforting Southwest flavor, featuring smoky chipotle peppers and protein-rich black beans. I love how quickly this skillet meal comes together for a healthy and comforting meal. 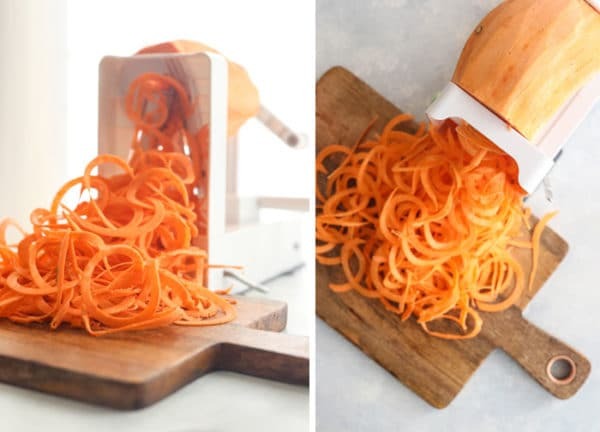 I find it easiest to use a spiralizer that suctions to your countertop (like the Inspiralizer) because sweet potatoes can have a tough texture to work with, similar to winter squash. In fact, if you’d rather use butternut squash for the “noodles” in this recipe, you can do that, too! This recipe comes from the Half Baked Harvest Cookbook, which is filled with beautiful recipes and photography. I’ve been a fan of Teighan’s work for years, and I love having her book in my kitchen. If you haven’t checked out her blog, I highly recommend it, too! This book is filled with a mix of gorgeous recipes, with some lighter options along with some decadent comfort foods. It’s not necessarily a “detox-friendly” cookbook, but I’m totally inspired by Teighan’s flavor combinations, so I love having this one in my kitchen. 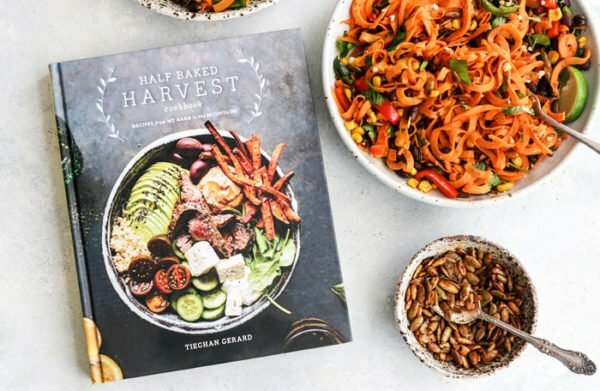 It’s a beautiful coffee table book, filled with recipes like Salted Brioche Cinnamon Rolls and No-Guilt Broccoli Fettuccine Alfredo (which uses hummus for creaminess). Since this is an easy skillet meal, you are in total control of the flavor. I think this dish packs a spicy kick as written, so if you need something a little more mild, feel free to omit the jalapenos or cut back on the chipotle peppers, as needed. You can always add more to taste, too! 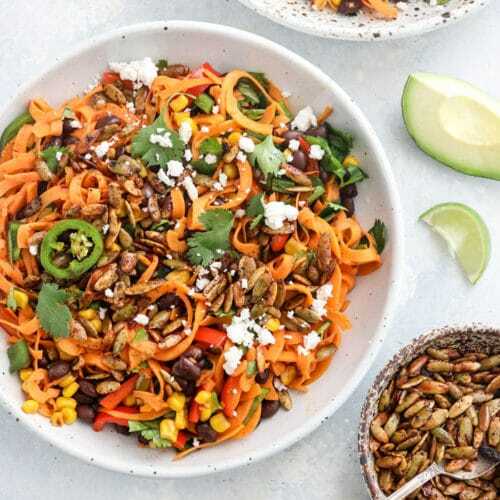 These CHIPOTLE SWEET POTATO NOODLES have a Southwestern-flair, tossed with spicy jalapenos and protein-rich black beans. In a large skillet, heat 2 tablespoons of the olive oil over medium. When it shimmers, add the sweet potatoes. Give everything a good toss and cook, stirring often, until the noodles have softened but are not mushy, 8 to 10 minutes. Stir the corn, bell pepper, and poblano and cook for 2 to 3 minutes more, until soft. Add the jalapeno and garlic and cook for 30 seconds to 1 minute more, until fragrant. Add the chipotles, honey, and a good pinch of salt and pepper. Toss to combine. Stir in the black beans, cilantro and lime juice, then remove the skillet from the heat. Meanwhile, in a separate small skillet, combine the remaining 2 tablespoons of olive oil, the pumpkin seeds, and the paprika. Toss to coat the seeds. Cook over medium heat, stirring often, until the seeds are lightly golden and toasted, 2 to 3 minutes. Remove from the heat and season with salt. 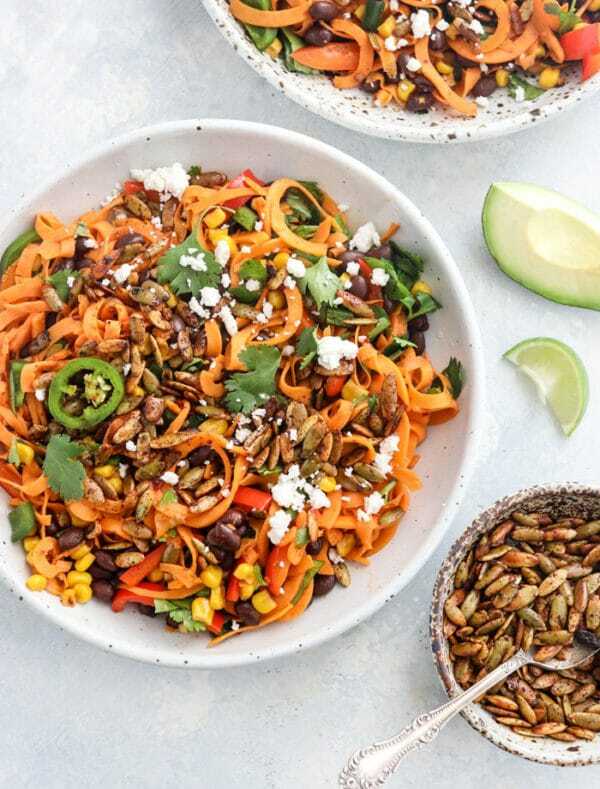 Divide the sweet potato noodles among three bowls and top each with some avocado, spiced pumpkin seeds, feta, and lime wedges. Serve warm. Reprinted with permission from the Half Baked Harvest Cookbook, by Teighan Gerard. This recipe is vegan if you omit the cheese as a topping and swap maple syrup for the honey as a sweetener. For a properly combined starch meal, skip the cheese and sunflower seeds when serving. As always, if you make any modifications to this recipe, please leave a comment below to let us know what worked for you. We can all benefit from your experience! 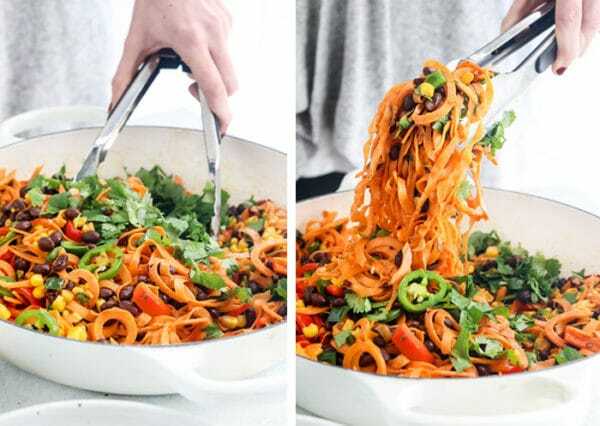 Reader Feedback: Have you tried sweet potato noodles yet? What’s your favorite way to serve them? Addendum to last post: I let this recipe sit in the fridge overnight and I served it for lunch the next day. The initial spicy heat had settled down and was just right! The toppings really made it especially good! Finished the meal with Megan’s Healthy Flourless Chocolate Cake – a must try!! Made this for lunch for my vegetarian daughter with the ingredients as shown. First time I have used any type of hot pepper in my life – Megan’s comments are correct when she says it has a spicy kick!! If you are not used to SPICY, go easy on the jalapeño peppers. So healthy and delicious, though, I will make it again (less spice). It was nice to step out of my comfort zone of meat and potato meals. Thank you for sharing this recipe! I just made it last night for Valentine’s day because my husband is gluten-free and LOVES spicy food. This is total comfort food! I love the sweet and spicy flavor that the honey and chipotle peppers bring out. Definitely will make again!